Resolve to make a change! Brown spots and areas of uneven pigmentation become things of the past with PicoWay, the amazing laser that zaps skin irregularities away. Featuring the identical PicoWay technology by Syneron Candela that so effectively removes tattoos, PicoWay Resolve uses a different hand piece to deliver the exact same ultra short pulses of laser energy. These pulses are measured in picoseconds (trillionths of a second) and are capable of breaking down pigment into minuscule particles. PicoWay Resolve utilizes holographic fractional technology which means that only a fraction of the skin is affected. The dual wavelength fractional module targets the melanin and leaves the surrounding healthy skin untouched. This new generation laser with its ultra fast picosecond high peak energy requires fewer treatments than other pigment lasers, causes less discomfort and provides better clearance of the pigmentation. Since the least amount of heat possible is transferred to the skin, this technology is safe for darker skin types too. Once excess pigment is shattered into tiny particles thanks to PicoWay Resolve’s ultra-fast delivery of concentrated high-power energy, it’s easier for the body to absorb and clear the pigmentation. Before long, brown spots, splotchy patches and other skin irregularities traceable to things like excessive sun exposure or hormones are gone. In a clinical study of the PicoWay Resolve, 96 percent of lesions had good or complete clearance and 86 percent of the patients were satisfied with the results. 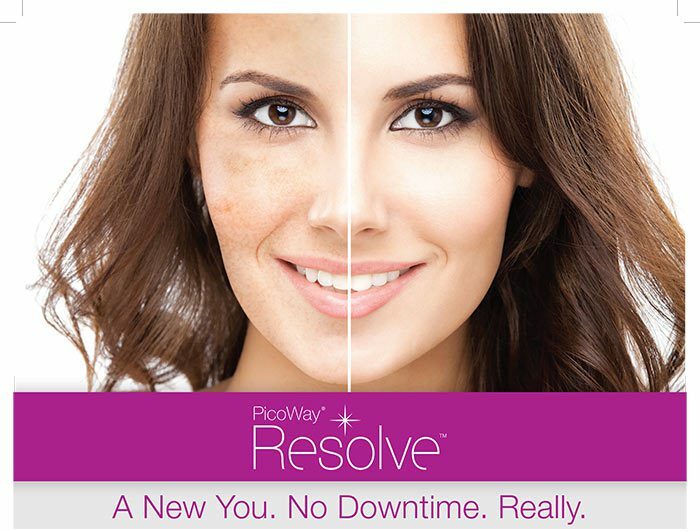 Take care of minor imperfections and make your skin appear youthful again with PicoWay Resolve. Attention: Hup, Two, Three, Four RSVP to Hair Loss Boot Camp!